I feel like I’ve got déjà vu – but in a good way. 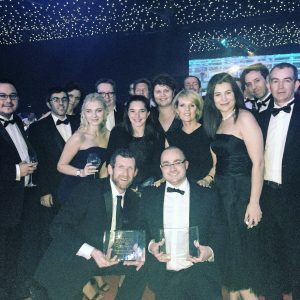 It doesn’t seem like a year since I was blogging about winning Digital Project of the Year for our digital platform so I’m delighted to be back with more good news from this year’s UK IT Industry Awards. HMRC won Digital Project of the Year for the second year running, this time for our Personal Tax Account (PTA). Such an amazing achievement, especially since the competition in the category was intense – some really inspiring deliveries. BCS were impressed by our team’s use of agile methodology and new ways of working. And the involvement of users, insight and feedback at every stage of the development to create a user friendly service available to millions of people. Very many congratulations to everyone involved. And the accolades didn’t stop with the PTA. Having made the final of the BCS awards in 9 different categories, HMRC scooped a total of 2 wins and 3 more of our finalists were highly commended by the judges. A true indication of how highly regarded our work is within the wider IT world. Ed Tucker, Head of Cyber Security, won Security Professional of the Year not just for his dedication to building security for HMRC and our customers but for his massive contribution and sharing of best practice with the wider security world. Well done Ed. Ed and his team were also highly commended in the Cyber Security Project of the Year for our Cyber Security Command Centres. The team was recognised for designing, building and launching the Command Centres, and using integrated new technologies to further mitigate the threat to our digital services, transforming our ability to protect our customers and our systems. Our Securing our Services Programme was highly commended for its work in transforming the security of our Digital Tax Platform, which hosts all of our digital services, enabling our millions of customers to access services ever more simply, safely and securely. And Amy Hart got a highly commended too in the IT Apprentice of the Year category. Another well-deserved award for Amy to add to her collection. We also had another four of our teams who beat strong competition to make the finals. Just getting here in so many categories demonstrates the great work being done across the whole of HMRC Digital to create customer-centric and secure services. Sitting in the audience, it was just great to have HMRC called out as finalists in 9 of the 25 categories and I think we were the organisation with the largest number of finalists. It just shows how we’re leading the way in cutting edge, large-scale digital transformation. So thank you to everyone who’s contributed to our work over the last year, our colleagues, suppliers, GDS and customers. And here’s to more good news to blog about this time next year!